Welsh success in the FA Cup may be limited to Cardiff City's 1927 triumph - but the competition has produced several memorable goals by Welsh players. From giant-killings to cup-clinching winners at Wembley, Wales has provided its fair share of FA Cup drama. And as this season's FA Cup reaches the third round and welcomes the Premier League's big hitters, BBC Wales Sport looks back at some of the competition's most famous goals from Welsh players. The home side's rapid turnaround was completed with Steve Watkin's winner two minutes later, which will go down in Welsh football history as the day David overcame football's Goliath. Cardiff - then playing in the old Second Division - hosted Premier League leaders Leeds at Ninian Park in 2002 and came out on top in an incident-packed third-round tie. Mark Viduka had given the visitors an early lead but Cardiff fought back superbly as captain Graham Kavanagh scored a superb free-kick before Leeds had Alan Smith sent off just before half-time. After the break, Cardiff dominated and Scott Young was the home side's hero when he powered in with three minutes left. Arsenal and Manchester United could not be separated when they met in the 1999 semi-final at Villa Park on 11 April as the Premier League's then top two played out a goalless draw. But three days later the last-ever FA Cup semi-final replay would go down in history as a night of high drama. Goals from David Beckham and Dennis Bergkamp either side of half-time left the tie poised at 1-1. Enter Ryan Giggs with 11 minutes remaining in extra time. The Wales winger took a leaf out of Diego Maradona's book by taking on the entire Arsenal defence. 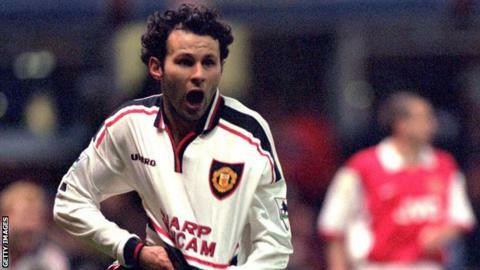 Jinking past four defenders, Giggs ensured helpless Seaman was again the victim of a famous Welsh strike as the winger smashed the ball into the roof of the net. Sir Alex Ferguson's side would go on to win an historic treble in the spring of that year, including beating Newcastle United in the FA Cup final. Liverpool met city rivals Everton in the 1989 FA Cup final, just five weeks after the Hillsborough disaster. Ninety-six Reds fans died during their semi-final against Nottingham Forest at the Sheffield ground. Little more than a month later, a city was united as Gerry Marsden led the two sets of supporters in an emotional rendition of You'll Never Walk Alone before kick-off at Wembley. An enthralling game followed with John Aldridge's early goal cancelled out in the last minute of normal time by Everton substitute Stuart McCall. Ian Rush restored Liverpool's lead with a smart shot on the turn in extra time and, after McCall again pegged them back, the Welshman scored a decisive second.